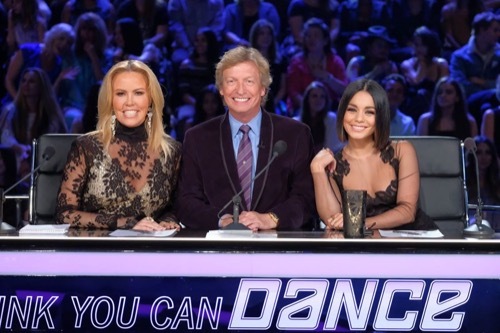 So You Think You Can Dance Season 14 episode 15 airs tonight from 8 PM – 10 PM and you don’t want to miss the end of the season. While you wait for your the So You Think You Can Dance recap make sure to check out all CDL’s SYTYCD recaps, spoilers, news & more. The dancers give an exciting performance to We’re Dancing on the Ceiling to kick off the finale. The entire season finalists are introduced. The all-stars join the on stage. Cat Deeley is introduced. Cat welcomes all of the judges. Vanessa will be performing a special routine tonight. Cat shows off a large group dance with all of the contestants performing choreography from Mandy Moore. The Top 4 tell the audience what it would feel like to win. Taylor feels like it would change her life. Koine thinks it is all amazing. Lex and his family has sacrificed a lot. Taylor thinks it has been an awesome experience. Kiki feels like even if he loses, he is happy for the experience. It is time for the judges to pick their favorite duets. Mary selects Kiki and Koine to perform their salsa. They take the stage to cheers. It is Vanessa’s turn. She selects Tyalor and Lex to dance their past disco number with all of the dancers on board. The entire group takes the stage and dances to the Bee Gees. It is Nigel’s turn. He picks Lex and Taylor to dance their romantic duet. Following their performance, the crowd stands with excitement. Cat tells Mary it is her turn to pick a group routine. She wants to see the African jazz routine. Vanessa chooses to see Dassy and Fiction dance together again. In their matching fedoras the two dance. It Is Nigels’ turn. He wants to see the all-stars dance to Ru Paul. We see a clip from the beginning of the season, as well as a clip revisiting the dancers being selected by the all-stars. Mary picks another duet that touched her in some way. Their sense of humor was what called to her. It is Lex and Koine’s pizza man duet! Choreographer Mia Michaels returned this week to choreograph a group routine and work with the Top 4. We see her rehearsals and talks with them. The all-stars perform their routine with chairs. It is an emotional contemporary piece. Everyone stands to applauding. Vanessa picks her favorite. It is a piece from Chris Scott that features Jasmine and Robert dancing to Bruno Mars’ Perm. The two dance with hairspray bottles spraying liberally while they dance around the stage with smiles. Cat introduces Travis Wall and Lex performing a piece together. The routine allows Lex to show off his best moves with spins and strength. The crowd goes wild. Marko speaks about partnering with Koine. The two take the stage to perform their romantic duet. Cat calls Koine and Marko up after their dancing. The two are sad and crying. Koine had given him a card before their dance. Cat tries to cheer them all up with some clips of everyone mispronouncing Koine’s name. Cat tells her they are all ashamed. It is time for another all-star pick. Gaby loves the hip-hop duet she performed with Lex. They take the stage to dance again. The judges dance to the music. Jenna talks about her favorite dances with Kiki. She chooses There Is Nothing Holding Me Back. The two take the stage. The audience whistles and screams for Kiki. All-star Robert chooses a Mandy Moore song he performed with Taylor as his favorite duet of the season. They take the stage. The audience gives them a standing ovation. Cat has some results. She calls the Top 4 on stage. It is time. She opens the envelope. The dancer in fourth place is Kiki. The other 3 leave the stage. Kiki hugs Cat. They show his finest moments. Vanessa takes the stage to sing and dance with Shawn Hook. Nigel chooses his last routine. It features the four dancing together. Cat kicks off the stage after their dance with a laugh as time counts down quickly. She calls the Top 3 back on stage. The third place dancer is Taylor. Lex and Koine leave the stage while Cat looks at the highlights of Taylor’s time on the show. It is down to the Top 2. Cat opens the envelope. The winner of the season is Lex!